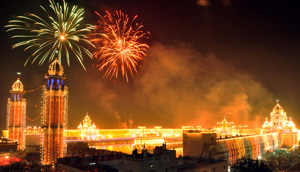 Diwali is also known as the �Festival of Lights�. It is an ancient hindu festival that takes place every autumn. 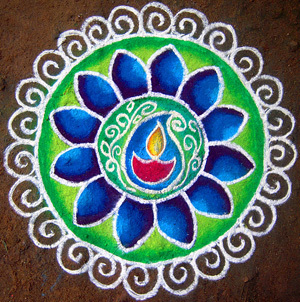 This festival symbolizes the power of good over evil, light over darkness, knowledge over ignorance, and hope over despair. It is a very happy celebration that lasts five days. This year, Diwali fell on October 23rd and is an official holiday in India, Nepal, Sri Lanka, Myanmar, Mauritius, Guyana, Trinidad, Tobago, Suriname, Malaysia, Singapore, and Fiji. This is the main festive day of the celebrations. People wear their new outfits and dress up for the night�s festivities. Lanterns (Diyas) are lit and offerings are made for Lakshmi, and depending on religion, also to Ganesha, Saraswati, and Kubera. These offerings are to promote good luck in the coming year. It is believed that Lakshmi roams the earth on this night, so people open their windows and doors to welcome her and place Diya lights on the windowsills and balconies to signify that she is welcome in their home. Mothers are also honored on this night, because she represents the good fortune and prosperity of the home. Clay lamps are lined up in rows by hindus along the parapets or temples and houses, while some cultures set Diyas on bodies of water. During the day, visits to family and friends are done and exchange small tokens of appreciation of their relationships. In the evening, prayers are performed and more offering rituals. After this, everyone goes outside to enjoy Patakhe, or fireworks. Children light sparklers and adults light large fireworks. The fireworks signify the chasing away of evil spirits. 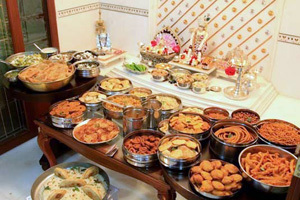 Then everyone heads inside to enjoy a large feast with family and friends followed by sweets.